A trillion is a thousand billion, and a billion is a thousand million. This makes one trillion, one million million. That is almost an inconceivable number to imagine. Humans are very good at estimating and appreciating small relative size jumps, but not things at this scale. Imagine you sit at a table counting dollars bills. One per second. You get to keep what you count. (It’s a fun fantasy). If you stopped after a minute, you’d have $60. If you counted, non-stop, for an entire day (24 hours) you’d earn $86,400. To earn a million dollars, you’d have to count, non-stop, for 11.57 days (a little less than two weeks). How long would it take to get to a billion dollars? Well, that’s a thousand times a million, so it’s 11.57 thousand days. That’s 31.7 years! That’s right, if you count at one dollar per second, non-stop, 24 hours a day from the day you were born, you’d have accumulated a billion dollars just before your 32nd birthday. Congratulations on your first billion! (Do it couple of hundred more times and give Jeff Bezos a challenge for the World's richest person). But how long to get to one trillion? A trillion is a thousand billion. So you’d need to be counting for 31.7 thousand years! 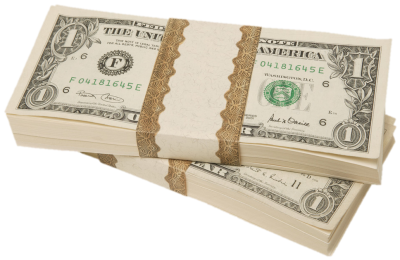 To count one trillion dollars, one dollar per second, would take 31,688 years! Below is a counter. It increments one dollar per second since you opened this page. How long before you get bored watching it? There are plenty of other things in the universe that it is hard for humans to conceive the scale about. Space, for instance, is really big! Another is just how much space there is in matter. ‘Stuff’ really is just 99.9999999999999% nothing!